With the budget sucking up the legislative oxygen in Colorado, AEE hosted an Advanced Energy Lobby Day in Denver, supporting a number of bills that will reshape the state’s energy market, creating significant investment opportunities for a rapidly growing industry here. Like other Western governors, Gov. Jared Polis entered office on the promise of expanding clean energy investments while ensuring a just transition for the communities impacted by the shifting economics of energy. The bills supported by AEE would help him fulfilled that promise. We navigated the Capitol, meeting with legislators between committee hearings and floor votes, communicating the business message on advanced energy. With a little less than a month of session remaining, we push forward on bills that would reduce barriers to EV charging infrastructure, securitization of coal-fired power plants to be retired, and carbon mitigation plans. It’s no surprise that advanced energy has a home in Nevada. But when your neighbors include Colorado, California, and New Mexico, the status quo just won’t cut it. 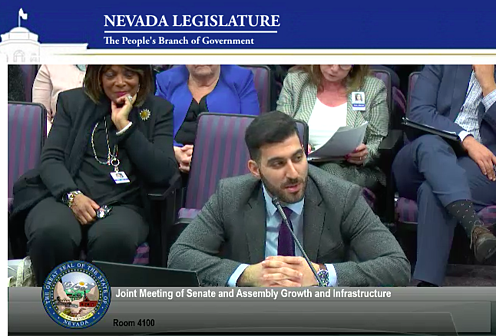 Hoping to keep pace regionally, Nevada’s Senate and Assembly Growth and Infrastructure Committee invited AEE, alongside former Colorado Governor and clean energy champion Bill Ritter and nonprofit solar developer Grid Alternatives, to present the economic case for expanding investments in advanced energy technologies. Ohio AEE hosted an Advanced Energy Showcase on March 7 in Columbus across from the Ohio State House. It was a busy day for legislators, with a big transportation bill on the floor. Nonetheless, we were joined by Sen. Steve Wilson, Senate PUC Chair; Representatives Jim Hoops, Nino Vitale, Niraj Antani, and staff from Sen. Marr Dolan’s office; Minority Leader Emilia Strong Sykes; and Rep. Jamie Callendar, the House PUC Chair, who is currently drafting energy legislation, and number of new members. The Indiana General Assembly has officially hit the halfway mark for the 2019 legislative session. With a part-time legislature, odd-numbered years are considered “long sessions,” ending no later than April 29 and with passing a biennial budget the only statutory duty. 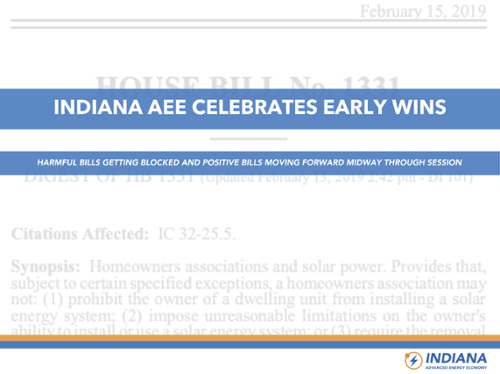 So far, AEE has worked to support legislation to move the market forward for advanced energy while trying to stop legislation that would go the other way. While advanced energy has historically faced barriers to deployment in the Hoosier State, momentum is building, with Northern Indiana Public Service Co. (NIPSCO) announcing its intent to close all existing coal operations by 2028 and invest in wind, solar, storage, and demand-side resources to save ratepayers $4 billion. Will Indiana legislators get on board the advanced energy bandwagon? Here is our halftime report on where key issues and policies stand. The outcome of the 2018 election cycle has the potential to cause a seismic shift in energy policy. 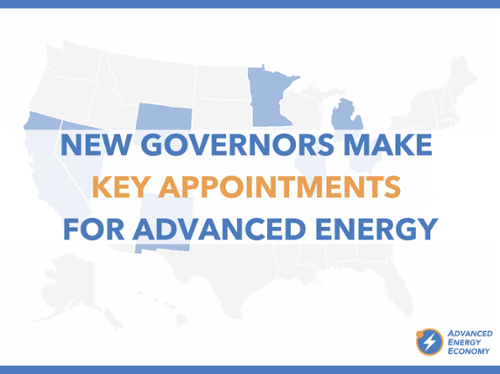 Last year, Advanced Energy Economy and our allies conducted a comprehensive campaign in nine targeted states to engage candidates for governor on the benefits of advanced energy. In seven of the nine states the winning candidates made strong commitments for expanding advanced energy in their states. While it is early in these new administrations, it’s not too soon for a snapshot of what’s happened to date and determine where promises are being kept or broken.